Now I am sure that this is a good round. But & it’s a BIG but! Like all Weatherby gear. What happens if you are out in the big beyond & the following happens? You forget to bring enough ammo? I have done that! Or God forbid! You have a malfunction & the local Gun Witch Doctor does not have the parts to fix it? Oops! It kind a puts a crimp on your hard earned fun time doesn’t it? Something to think about huh? .224 Weatherby Magnum maximum C.I.P. cartridge dimensions. All sizes in millimeters (mm) plus Imperial (inches). 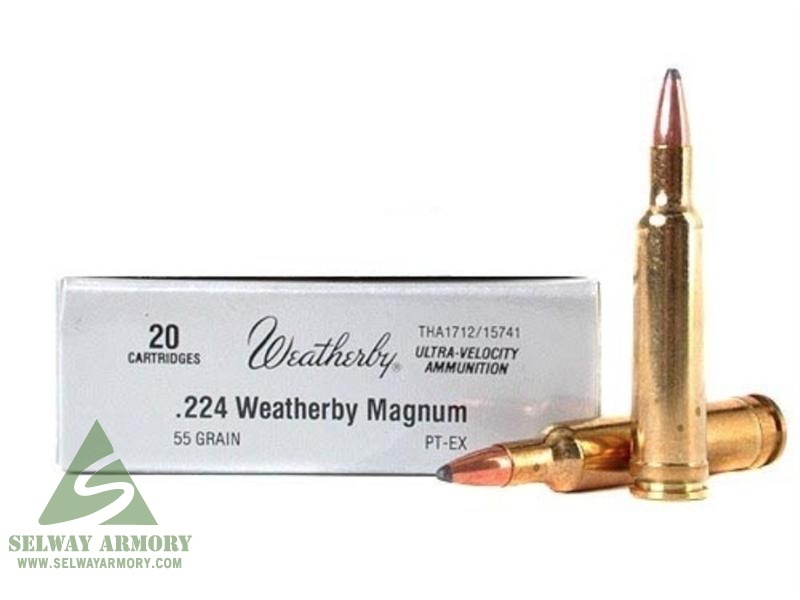 The .224 Weatherby Magnum (5.56×49mmB) is a sporting cartridge that was developed in 1963 by Roy Weatherby after about 10 years of development. It is a proprietary cartridge with no major firearms manufacturers chambering rifles for it other than Weatherby. It was originally called the .224 Weatherby Varmintmaster when it was introduced alongside the Weatherby Varmintmaster rifle, but the rifle was discontinued in 1994 and the cartridge was renamed. The cartridge design began years earlier but its introduction was delayed, at least in part, because of the unavailability of a suitable action. An earlier high-velocity .22 caliber round from Weatherby called the .220 Weatherby Rocket was based on the .220 Swift though it was unsuccessful and never manufactured. Performance is similar to the popular .22-250 and the lesser used .225 Winchester putting it in between the .220 Swift and .223 Remington cartridges. Possibly because of the similar performance and popularity of the .22-250, this round has never gotten a very large following. Costs for ammunition and rifles for this round also tend to be much more expensive. .22 caliber rifles are legal in some areas for big game up to the size of deer or larger. Convention holds the .224 Weatherby and similar cartridges are better suited to long-range varminting. Similar statements are made concerning other “big” 22 caliber cartridges like the 220 Swift and .223 WSSM. Currently many states in the United States do allow 22 caliber rifles on big game, but the majority require a minimum of 6mm. Well known firearms author P.O. Ackley believed that fast 22 caliber cartridges were suitable for medium-large game. Craig Boddington has said that such cartridges are suitable for smaller deer. Bullets suited for hunting big-game are available from major manufacturers such as Nosler and Barnes. 5 mm caliber, other cartridges of 5–6 mm (.200–.236 in) caliber. ^ Jump up to:a b “Centerfire .22s For Big Game”. Archived from the original on 15 April 2010. Retrieved 2010-06-29. Jump up^ “Nosler’s Big-Game Bullets”. Retrieved 2010-06-29. Previous Previous post: Some N.S.F.W. for my great Readers! Next Next post: The Story of Grumpy!